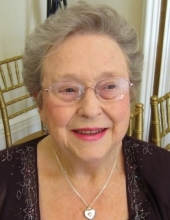 Virginia Louise “Ginny” Cooper, 86, of Davis, IL died at 4:05 p.m. on Wednesday, March 20, 2019 at Medina Manor Nursing Home. Born September 19, 1932 in Clinton, WI, the daughter of Mr. and Mrs. Floyde and Margaret (Hogan) Kelsey, graduated from Durand High School, Class of 1950. Virginia lived in Davis, IL for 42 years, coming from Winnebago, IL. She married the former Roland C. Cooper in Durand, IL on August 27, 1955. Virginia was employed as a bookkeeper by Ingersoll for five years before becoming a dairy farmer's wife. Virginia was a member of First Baptist Church in Pecatonica, IL where she was very involved serving as a faithful servant of God and as a Sunday School teacher. She had the gift of people, being able to pick up where she left off with them as if no time had passed. Ginny was fondly known as the candy lady by many and will be remembered for her great love of faith and people. Survivors include Daniel (Judy) Cooper of Augusta, GA; daughter Patricia (John) Shiro of Rockford, IL; granddaughter Lindsey (Wesley) Thomason of Augusta, GA; great granddaughter Amber Thomason of Augusta, GA; sister Shirley Sweet of Durand, IL; sister Kathy Whitehouse of New Libson, WI and many nieces and nephews. She is preceded in death by her husband Roland who died in 2001, son Timothy Roland, parents, brothers Weyburn Kelsey and Phil Kelsey, sister Sally Lawson and brothers-in-law Jim Sweet and Lyle Whitehouse. The family would like to send a special thank you to Medina for their tender love and care given to Virginia. Funeral Ceremonies will be held at 10:00 a.m., Friday, March 29, 2019 in First Baptist Church, 819 Washington Street, Pecatonica, IL with the Pastor David Myers officiating. Burial will be in Durand Township Cemetery. A visitation will be held at McCorkle Funeral Home- Durand Chapel, 101 W. Main Street, Durand, IL from 4:00 p.m. to 8:00 p.m. on Thursday, March 28, 2019. A memorial has been established to First Baptist Church, Pecatonica, IL and Medina Manor Nursing Center, 402 S. Center Road, Durand, IL. To send flowers or a remembrance gift to the family of Virginia Louise Cooper, please visit our Tribute Store. "Email Address" would like to share the life celebration of Virginia Louise Cooper. Click on the "link" to go to share a favorite memory or leave a condolence message for the family.